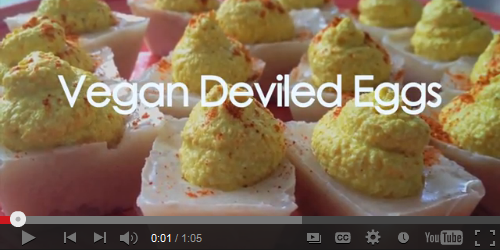 In light of springtime holidays like Passover and Easter, the Miscellany News Multimedia Team has brought you a version of deviled eggs free of animal products, cholesterol, and saturated fat. Add this healthy, tasty treat to your next holiday table! This recipe implements a specialty food common in Japanese cuisine known as agar agar, a type of seaweed that acts as a gelling agent—it’s essentially a vegetarian gelatin. Agar agar is available in flake form at House of Nutrition and in powder form at other health/specialty food stores. You can follow along with the recipe below. In a small saucepan, combine the soy milk and agar agar, bring to a boil, and simmer until dissolved, about 5 minutes. Pour the mixture into an ice cube tray and let cool in the refrigerator until set, about 30 minutes. Meanwhile, combine all of the ingredients from tofu through turmeric in the bowl of a food processor and process until smooth. When the “egg” whites have cooled, remove them from the ice cube tray and scoop a hole in the middle of each of them with a teaspoon. Cut a hole in the corner of a Ziploc bag, scoop the “yolk” mixture into the bag, and pipe the mixture into the whites. Sprinkle with paprika to taste.